Time magazine named Facebook’s CEO, Mark Zuckerberg, as its “Person of the Year” for 2010. In 2004, Zuckerberg, an American, started Facebook along with some friends while he was a student at Harvard University. He dropped out of Harvard to work on Facebook. Today, Facebook has over 500 million users. 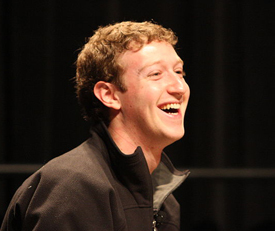 Zuckerberg is now 26 years old, and his ownership in Facebook is estimated to be worth about US$7 billion. Facebook is a social networking website, and many of us keep in touch with friends through such websites. These are sites where you can set up your own page with information about yourself, and you can connect with other friends or people who share your interests. Besides exchanging messages with friends, you can easily keep up with what your friends are doing – music they’re listening to, books they’re reading, videos they’re watching, and so on. Facebook is one of the most popular and fastest growing social networking websites. There is even a movie about Facebook called “The Social Network” that was released earlier this year. The Person of the Year award by Time magazine has been awarded since 1927. The award is given to individuals (or sometimes groups of people or even things) that significantly influence the world, for better or worse. There have been some interesting winners in the past that were not individuals. In 2006, the Person of the Year was “You”, as in all of us. This was to recognize the impact that user-generated information has caused because of the Internet. In 1982, the award went to the computer for the impact it was having on us. In 1988, planet Earth was the winner because our environment and its protection became a significant subject.